Home / Knee pain when you squat? 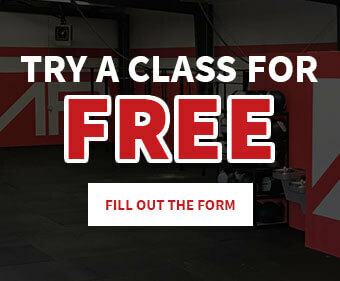 Try this..
Do you hate squatting because of nagging knee pain? It probably has something to do with the way you’re squatting. 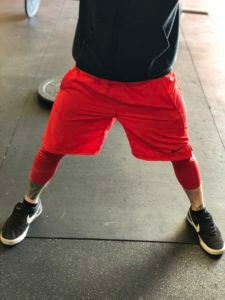 Maybe you were never taught how to squat correctly.. maybe your mobility is limiting you.. we will talk about form and mobility on another day. In the meantime try these tricks or alternative exercises that are great for building the same muscle without the knee pain! Using a wider squat stance will put more of the weight into your hips rather than your knees. Make sure to track the knees over your toes. Be sure to pay attention to your knees buckling in because this is a big reason that people experience knee pain in most cases. 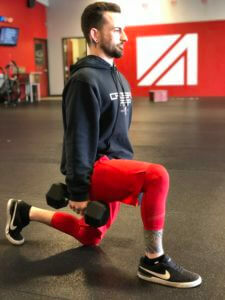 Lunges are a great way to work the same muscles while taking pressure off the knees. Make sure to use full range of motion. Gently touch the ground with your trailing knee. Keep the front shin vertical and heel on the ground. Step ups are a great alternative to squatting. Hold two dumbbells at your side and pick a box height around 20”-24”. Remember to keep your chest up when you step onto the box. Squatting to a box is another great scaling option. We usually use this as a last resort because of the limited range of motion. Try to pick a box that’s as low as possible without aggravating your knees. Use a wider than normal stance and make sure to sit back to the box. As simple as these exercises are, they can do a great deal in preventing knee pain if you consistently work at improving and taking your time to really focus on the proper movements. For more tips and advice from our expert coaches, make sure to subscribe to our podcast and follow us on social media.